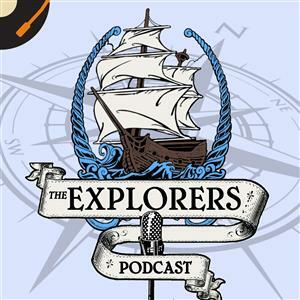 Explorers takes an in depth look at history's greatest explorers. Lewis and Clark fight their way across the Rocky Mountains and make for the Pacific Coast.Learn more about your ad choices. Visit megaphone.fm/adchoices. . .
Lewis and Clark struggle up the Missouri River and find that there is no easy route over the Rocky MountainsLearn more about your ad choices. Visit megaphone.fm/adchoices. . . In the late summer and fall of 1804, Lewis and Clark and the Corps of Discovery head into the lands of the powerful Sioux nation, aiming to reach the Mandan Villages, located near modern-day Bismarck, North Dakota.Learn more about your ad choices. Visit megaphone.fm/adchoices. . .
Lewis and Clark head up the Missouri River in the spring of 1804.Learn more about your ad choices. Visit megaphone.fm/adchoices. . . In Part 1 of our series, Meriwether Lewis and William Clark prepare to lead the Corps of Discovery west in an attempt to reach the Pacific Ocean. In this episode, we go into the background of the Louisiana Territory, discuss the man most responsible for the expedition (Thomas Jefferson), and look into the backgrounds of Lewis and Clark. We then get the two men to St. Louis as they assemble their expedition - and prepare to head into the unknown.Learn more about your ad choices. Visit megaphone.fm/adchoices. . . In January of 1890, Nellie Bly sailed from Japan in her race around the world. And while the ocean voyage would present its own challenges, a massive snowstorm in the American west would threaten Bly's attempt to defeat Phileas Fogg - as well as her rival - Elizabeth Bisland.Learn more about your ad choices. Visit megaphone.fm/adchoices. . . Delayed ships, monsoons and other obstacles test journalist Nellie Bly as she travels from France to Asia, Meanwhile, her rival in the race around the world, Elizabeth Bisland, threatens to upstage Bly by beating her back to New York.Learn more about your ad choices. Visit megaphone.fm/adchoices. . . In 1889, a New York Journalist, Nellie Bly, began a journey to civrcumnativage the globe. Her goal was to best Phileas Fogg - the hero of Jules Verne's "Around the World in 80 Days." Little did she know that a rival publication would send their own reporter on a similar journey - only heading in the opposite direction - setting up a dramatic race that would capture the attention of the world.Learn more about your ad choices. Visit megaphone.fm/adchoices. . . In about 325 BCE Pytheas of Massalia begins one of the first great voyages of discovery when he sets out into the land of the Celts to find the legendary island of Britain. In the process, Pytheas will be the first known man to circumnavigate the island.Learn more about your ad choices. Visit megaphone.fm/adchoices. . . In the final episode in our seven-part series on Christopher Columbus, the Admiral and his crew find themselves stranded on the island of Jamaica.Learn more about your ad choices. Visit megaphone.fm/adchoices. . .
Columbus sets out on his fourth and final voyage. This time he's been ordered to find a passage to Asia - a voyage that will take him along the Central American coast.Learn more about your ad choices. Visit megaphone.fm/adchoices. . . In his third voyage to the New World, Christopher Columbus searched out the rumored lands to the south - and in the process, discover the South American continent.Learn more about your ad choices. Visit megaphone.fm/adchoices. . .
Part 4 in our series on Christopher Columbus details his exploration of Cuba and Jamaica, plus his subjugation of Hispaniola.Learn more about your ad choices. Visit megaphone.fm/adchoices. . .
Christopher Columbus heads to the New World for a second voyage. This time he has 17 ships and more than 1,200 men. The object is to establish a viable commercial enterprise in this newly discovered land.Learn more about your ad choices. Visit megaphone.fm/adchoices. . .
Christopher Columbus sets off on his historic first voyage - one that would become the most important voyage of discovery in history.Learn more about your ad choices. Visit megaphone.fm/adchoices. . .
Christopher Columbus tries to secure backing for an expedition to cross the Atlantic in a daring attempt to reach Asia.Learn more about your ad choices. Visit megaphone.fm/adchoices. . .
Francisco de Orellana heads down the Amazon River in a desperate bid to return to civilization.Learn more about your ad choices. Visit megaphone.fm/adchoices. . .
Francisco de Orellana and Gonzalo Pizarro head over the Andes in search of El Dorado - the City of Gold. Instead, they only find death, forcing Orellana to begin a desperate 4,000 mile journey down the Amazon to reach safety.Learn more about your ad choices. Visit megaphone.fm/adchoices. . .
Zheng He commands the legendary Chinese Treasure Fleet, which sailed the Indian Ocean in the 15th centuryLearn more about your ad choices. Visit megaphone.fm/adchoices. . .
Étienne Brûlé, the most famous of the Coureur de bois, explores the lands around the St. Lawrence River and the Great Lakes.Learn more about your ad choices. Visit megaphone.fm/adchoices. . . In one of the greatest journeys of survival - and exploration - ever recorded, Álvar Núñez Cabeza de Vaca begins a 2,500 mile trek across Mexico in a bid to return to Spanish territory.Learn more about your ad choices. Visit megaphone.fm/adchoices. . .
Stranded and alone in modern day Texas, Álvar Núñez Cabeza de Vaca begins a remarkable eight year struggle to return home.Learn more about your ad choices. Visit megaphone.fm/adchoices. . .
Spanish conquistador Pánfilo de Narváez heads to Florida in search of gold - only to find lots and lots of misery.Learn more about your ad choices. Visit megaphone.fm/adchoices. . .
Portuguese explorer Bartolomeu Dias becomes the man to round the southern tip of Africa.Learn more about your ad choices. Visit megaphone.fm/adchoices. . .
Mungo Park returns to West Africa with a large expedition, determined to map the Niger River and find the city of TimbuktuLearn more about your ad choices. Visit megaphone.fm/adchoices. . .
Scottish explorer Mungo Park ventures into West Africa to find the Niger River and the legendary city of TimbuktuLearn more about your ad choices. Visit megaphone.fm/adchoices. . .
Italian explorer John Cabot, sailing for England, becomes the first European to land in North America since Leif Erikson.Learn more about your ad choices. Visit megaphone.fm/adchoices. . . The father and son duo of Erik the Red and Leif Erikson found the colony of Greenland, and become the first Europeans to arrive in North America.Learn more about your ad choices. Visit megaphone.fm/adchoices. . .
Zebulon Pike sets off into the Louisiana TerritoryLearn more about your ad choices. Visit megaphone.fm/adchoices. . .
American explorers, including Zebulon Pike, set out to explore the newly acquired Louisiana TerritoryLearn more about your ad choices. Visit megaphone.fm/adchoices. . .
Balboa sets off to find the mysterious sea on the other side of the mountainsLearn more about your ad choices. Visit megaphone.fm/adchoices. . .
Balboa and the Spanish quest for gold leads him to establish the first permanent European colony in the AmericasLearn more about your ad choices. Visit megaphone.fm/adchoices. . .
Juan Sebastián Elcano takes the reins of the fleet as they try and finish the circumnavigation of the world.Learn more about your ad choices. Visit megaphone.fm/adchoices. . .
Magellan and the Armada de Molucca set sail across the Pacific in search of the Spice IslandsLearn more about your ad choices. Visit megaphone.fm/adchoices. . .
Magellan sets sail for South America to find the strait that will take him to the Western SeaLearn more about your ad choices. Visit megaphone.fm/adchoices. . .
We take a look at the background that led Magellan to undertake his expedition to the Spice Islands, including the rejection by his native land, Portugal. He then must navigate the intrigue of the Spanish court to assemble his fleet - the Armada de Molucca.Learn more about your ad choices. Visit megaphone.fm/adchoices. . .